Senator Inouye has received numerous awards as a military figure in recognition of his bravery and unflagging service to the country. Evan and Kari engage Senator Daniel Inouye on a discussion, delivering a story about persistence, tenacity, and determination. In this interview, Senator Inouye puts forward a biographic account of his rise as a political powerhouse. He shares a life of hardship, growing up in the plantation, which would be the catalyst to his determined stature to succeed. Senator Inouye also talks about a consequential event at a military camp that would save his life and permanently influence his perception in giving back to society. Watch this interview and gather more insights about the greatness of man in times of tribulation and the serendipitous events that shapes his character to encompass a sense of service to the people. Senator Daniel K. Inouye was born in Honolulu, Hawaii on September 7, 1924, and was named after a Methodist minister who had adopted his mother. Young Dan Inouye attended Honolulu public schools and earned pocket money by parking cars at the old Honolulu Stadium and giving haircuts to fellow students. Most of his earnings were spent on a flock of homing pigeons, a postage stamp collection, parts for crystal radio sets and chemistry sets. On December 7, 1941, the fateful day of the Japanese attack on Pearl Harbor, 17-year-old Dan Inouye was one of the first Americans to handle civilian casualties in the Pacific war. He had taken medical aid training and was pressed into service as head of a first-aid litter team. He saw a “lot of blood” and did not go home for a week. In March 1943, 18-year-old Dan Inouye, then a freshman in pre-medical studies at the University of Hawaii, enlisted in the U.S. Army’s 442nd Regimental Combat Team, the famed “Go For Broke” regiment. Inouye was soon promoted to the rank of Sergeant and was designated as a combat platoon leader during the Italian campaign. He slogged through nearly three bloody months of the Rome Arno campaign with the U.S. Fifth Army. In the fall of 1944, Inouye’s unit was shifted to the French Vosges Mountains and spent two of the bloodiest weeks of the war rescuing a Texas Battalion surrounded by German forces. The rescue of “The Lost Battalion” is listed in the U.S. Army annals as one of the most significant military battles of the century. Inouye lost ten pounds, became a platoon leader and won the Bronze Star and a battlefield commission as a Second Lieutenant. Back in Italy, the 442nd was assaulting a heavily defended hill in the closing months of the war when Lieutenant Inouye was hit in his abdomen by a bullet which came out his back, barely missing his spine. He continued to lead the platoon and advanced alone against a machine gun nest which had his men pinned down. He tossed two hand grenades with devastating effect before his right arm was shattered by a German rifle grenade at close range. Inouye threw his last grenade with his left hand, attacked with a submachine gun and was finally knocked down the hill by a bullet in the leg. 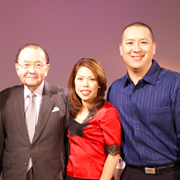 Dan Inouye spent 20 months in Army hospitals after losing his right arm. On May 27, 1947, he was honorably discharged and returned home as a Captain with a Distinguished Service Cross (the second highest award for military valor), Bronze Star, Purple Heart with cluster and 12 other medals and citations. His Distinguished Service Cross was recently upgraded to a Medal of Honor, the nation’s highest award for military valor. He received that medal from the President of the United States on June 21, 2000. With financial assistance from the G.I. Bill, Inouye graduated from the University of Hawaii and the George Washington University Law School. Then, he returned to Hawaii and served as a Deputy Public Prosecutor for the city of Honolulu. He broke into politics in 1954 with his election to the Territorial House of Representatives. He later won election to the Territorial Senate. When Hawaii became a state on August 21, 1959, Daniel Inouye won election to the United States House of Representatives as the new state’s first Congressman. He was reelected to a full term in 1960. Elected to the United States Senate in 1962, Inouye is currently serving his seventh consecutive term in the Senate. Senator Inouye has championed the interests of Hawaii’s people throughout his career. In 1993, he was instrumental in engineering the restoration and return of Kahoolawe, an island that had been used as target practice by the military, to the State of Hawaii. He has also fought for improved education and health care for all children, additional jobs for Hawaii’s economy, health and human services in rural communities, affordable housing, and the protection of America’s natural resources. A nationally known leader and the third most senior member of the United States Senate, Senator Inouye has played a major role in shaping the defense policies of the United States. He has worked to strengthen the armed forces, and enhance the quality of life for military personnel and their families. Tuesday last was the third anniversary of the admission of Hawaii. Today is the third anniversary of one of the most dramatic and moving scenes ever to occur in this House. On that day, a young man, just elected to Congress from the brand new state, walked into the well of the House and faced the late Speaker Sam Rayburn. The House was very still. It was about to witness the swearing in, not only of the first Congressman from Hawaii, but the first American of Japanese descent to serve in either House of Congress. “Raise your right hand and repeat after me,” intoned Speaker Rayburn. The hush deepened as the young Congressman raised not his right hand but his left and he repeated the oath of office. There was no right hand, Mr. Speaker. It had been lost in combat by that young American soldier in World War II. Who can deny that, at that moment, a ton of prejudice slipped quietly to the floor of the House of Representatives. ·	September 7, 1924. Born, the eldest of four children, to Hyotaro and Kame Inouye. ·	1942. Graduated from McKinley High School. ·	1944-1947. Served in the U.S. Army 442nd Regimental Combat Team. ·	June 12, 1948. Married Margaret Shinobu Awamura. ·	1950. Graduated from the University of Hawaii with a B.A. degree for a double major in economics and government. ·	1952. Graduated from George Washington University Law School with a J.D. degree. ·	1953-1954. Served as Deputy Public Prosecutor, City and County of Honolulu. ·	1954. Elected to the Hawaii Territorial House of Representatives; reelected in 1956. ·	1958. Elected to the Hawaii Territorial Senate. ·	1959. Elected to the U.S. House of Representatives as the 50th State’s first Congressman; reelected in 1960. ·	1962. Elected to the United States Senate; reelected in 1968, 1974, 1980, 1986, 1992, and 1998. ·	1968. Delivered the keynote address at the Democratic National Convention in Chicago, appealing for racial understanding and progressive change through democratic institutions. ·	1973-1974. Gained national recognition and respect as a member of the Senate Watergate Committee. ·	1976-1979. Became the first Chairman of the Senate Select Committee in Intelligence, a post he voluntarily relinquished after one term. ·	1979-1988. Served as the third-ranking leader among Senate Democrats as Secretary of the Democratic Conference. ·	1987. Chaired the Senate Select Committee on Secret Military Assistance to Iran and the Nicaraguan Opposition, which held public hearings on the Iran-Contra affair. ·	1988. Secured passage of the Native Hawaiian Education Act and Native Hawaiian Health Care Act. ·	1991. Served as Chairman of the Democratic Steering Committee. ·	1999. Presented the Spirit of Hope award, the highest honor given by the United Service Organizations, or USO, for epitomizing honor, courage and selfless service. ·	2000. Awarded the Grand Cordon of the Order of the Rising Sun from the Government of Japan for distinguished merit. ·	2000. Received the Medal of Honor from President Clinton in a White House ceremony. ·	2001. Awarded an honorary degree from Georgetown University School of Nursing Health Studies, Washington, D.C.
·	2001. Dedication ceremony for the Daniel K. Inouye Building at the Walter Reed Army Institute of Research, Naval Medical Research Center, Bethesda, Maryland. ·	2002. Presented the Advocacy Conference Congressional Award from the National Breast Cancer Coalition. ·	2002. Received the Friend of the Coast award from the American Coastal Coalition for preserving coral reef ecosystems in the Western Pacific. ·	2002. Designated an honorary member of the Class of 1949 of the United States Military Academy. While serving in Europe in 1945 with the highly decorated 442nd Regimental Combat Team, Senator Inouye received an appointment to join the Class of 1949 at West Point. But combat action in which he lost his right arm while displaying exceptional valor prevented him from accepting the appointment. ·	2002. Received the United States Army Doughboy Award in recognition of his outstanding contribution to the United States Army Infantry. ·	2003. Presented the Sonny Montgomery Award from the National Guard Bureau for exceptional support of the nation’s defense.